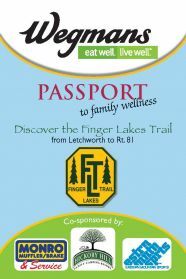 Many of you are aware of the Passport project that the Finger Lakes Trail Conference developed with Wegmans, Eastern Mountain Sports, Monro Muffler Brake and Hickory Hill Family Camping Resort. Booklets are still available at Wegmans stores (in the passport area) and most of our other sponsors. You can also download a PDF version via the FLT website. The 12 hikes are on the Finger Lakes Trail or one of the branches between Letchworth on the West and Interstate Rt. 81 on the east. A minimum of 4 hikes is required to get the patch and coupons from our sponsors. If you've been out there hiking some of the sections, please don't forget to send in your "rubbings" page before October. If you haven't started yet, there is still time. Most of the hikes are fairly short and family friendly. 0 Comments to "Passport for the Finger Lakes Trail"